How many of you have been to a blog conference? I haven't, but that's going to change come May. I am going to be attending the Casual Blog Conference. I'm really excited about it! I decided the Casual Blog Conference would be a great first time conference for me for many reasons. Beside the fact that it's set near my home, the CBC is for all kinds of bloggers, not just exclusive to the heavy hitters of the big blog world. The CBC is offering numerous classes on photography, writing, blogging, design, digital scrapbooking, social media, advertising and more. Plus they have a great lineup of great speakers. Soon after I bought my tickets I started thinking about the conference and started getting a little nervous. I always get a little nervous when I do new things. I guess I just like to know what I am getting myself into, if you know what I mean. I decided the best way to relax and not worry about the CBC was to learn more about blog conferences, so I recruited the help from a few bloggers to help attendees (myself included) get ready. Here's what these bloggers had to say. Prepare to be overwhelmed with great information. A conference is a great way to meet your blogging friends, to learn about how to take your blog to the next level and to make some good connections. You can expect a lot of socializing, parties, and learning from some of your favorites (hopefully). Expect to put yourself out there. Its almost like going to a new school for the first time, not AS scary because most of the women are quite nice. Just know that you really to get noticed, learn things, make connections just take a deep breath and jump in. If you do you will learn even more. Although you will learn quite a bit in all of the wonderful classes! Expect lots of FUN! TONS of networking so be prepared. Lots of blog chat, lots of meeting new friends, maybe stepping a bit outside your comfort zone. Get ready to make new friends. Conferences are all about meeting people in real life. You come out from behind the computer to meet and greet in person. It's fun to get to know other people and talk blogs, something we all have a passion for. I think I have learned the most at conferences simply by opening up conversation to other attendees. It is a unique atmosphere in which everyone involved is wanting to learn and share. You don't get that opportunity a lot so take advantage of it! Talk with the people you admire, ask them what has worked for them, it's the one time to do it. This is not the time to be shy. Read up on the speakers. Read their blogs know more about them and make a list of questions for them. If the session goes to Q&A you will be prepared. Prepare to make connections. Use that time with companies and bloggers to network. Great blog posts/giveaways can come from your time spent at these conferences. Take good care of yourself so you feel and look great! Nothing would be worse than going with no sleep or feeling sick and make a kinda of blah first impression to all of the people you meet. I didn't do much to prepare.One sweet person made little business card holders to pass out at the conference so I thought that was a sweet little touch. I may make a little something to bring at the next conference I go to. Find out who the speakers are going to be. Read their bios and check out their blogs. It's good to know what their background is and what you might be able to ask them at the conference. Make your business cards stand out! The last conference I went to I was amazed at how creative everyone was. I remembered those people. I checked their blogs, their cards were cool, they had to be, right? Find out who will be speaking and get familiar with there blogs. Link to them, introduce yourself, anything so that when you have a chance to talk to them at the conference, you will already have a connection. You should always bring your blog/business/mom card...and lots of them. You will meet a lot of people in a short period of time, and exchanging cards is a great way for them to remember you and for you to remember them. DO bring business cards, don't break the bank buying them, just spend a bit but do bring them and don't be shy to hand them out! Take notes, that you will actually look over again! Write down names, blogs of people, twitter handles etc. Business cards and be sure to hand them out. I didn't hand out as many cards as I thought I would but I wish I had! Bring a nice evening dress, in case there's a nice party or something. I brought jeans, but they had a fun party after the first day and I felt so silly in my jeans. I like to have a pen and paper in hand as I'm always getting inspired with new ideas for my own blog that I want to write down to remember. You can bring your laptop, but I never seem to pull it out of my bag. The pen and paper seem to do just fine. There will be a lot of information to process all at once. So take a pen and notebook for writing down key points. That way you can go home and have a chance to really absorb it all. Bring a bag, there always seems to be a lot to collect at conferences. Bring your camera! I never have, and always regret it. And a smile of course. Don't forget about all the fun parties that often surround conferences. Sign-up for them ahead of time because most if not all will fill up way ahead of time. Have fun! Think of this time as a girls trip or a girls night out, and enjoy it! If you take a pal with you so you are not as scared be sure not to use them as a crutch. This is all about meeting new people, learning from them and using these connections to help you in the blog world. At the blog conference I went to, some girls planned a dinner get together and that was so fun and surreal to have dinner with so many blog friends. If you can, plan a dinner or a get together with some friends you know will be going so you can be sure to meet up.. beyond just seeing each other at the conference. Shares three reasons to attend a blog conference. Go to the social aspects of the conference, you'll find that is where you make the best contacts. 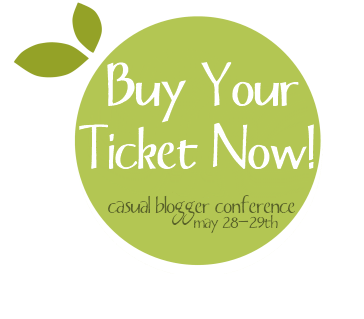 Will you be attending the Casual Blogger Conference? I'm excited to meet and share ideas with everyone else out there. Come introduce yourself and I hope I see you there! Vanessa, Destri and April will be speaking at the Casual Blog Conference so look for them! Tickets are sold out but you can get on the waiting list here. This is my first year going myself! I can NOT wait to go!!!!! Me and my bestie are hitting it up together! See ya there! What a great post! Thanks for including me. I'm getting excited for CBC! You can get other tips and conference prep/experience stories at www.BlogConferenceNewbie.com. Have a blast at CBC! What? Just like going to a new school? I'm a little bit scared myself. What a great post, Dee-Dee! I loved hearing what every one had to say. Thank you for including me! Great job Dee Dee, love this post! Thanks so much for having me. Happy SITS Saturday Sharefest! I hope you have a wonderful weekend. wow..... I never thought about attending a conference until I read your post. I would love to learn more about blog design... thanks! In November, I will be attending my 1st blogging conference in Miami! I'm so excited and yet nervous all at the same time. I loved reading all of the tips and suggestions. They were very helpful. found your blog through...uhhh not sure, but i saw this post and i thought i would comment--i'm going to CBC and it's my first conference, too! can't wait. maybe i'll see you there! I loved this post! Very good tips for first-timers at a Blogging Conference! I'm getting excited. Maybe I'll see you there? Thanyou so much for this post! I a going to CBC and really nervous I don;t know anyone! This advice will be of great help!! Great idea for a post. Thanks for asking me to be a part of it. Great post! Looking forward to seeing you (again) at CBC!